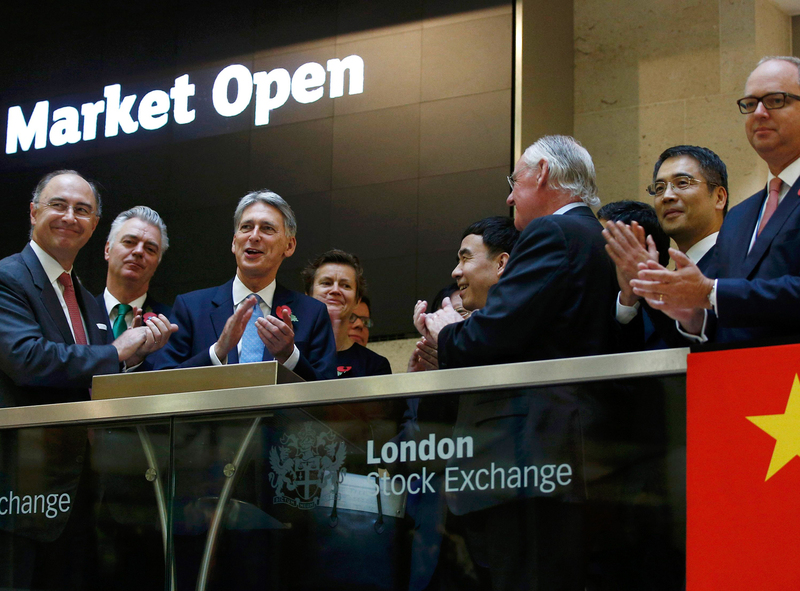 Britain’s Chancellor of the Exchequer, Philip Hammond (third from left), opens the London Stock Exchange, joined by a banking and financial delegation from China, in London, England, November 10, 2016. This article was first published by Caixin. Translated by Teng Jing Xuan. How should China measure the results of its future efforts at opening up? Recently, central-bank chief Yi Gang told Caixin that China’s financial opening-up “should not only follow the commitments made for the World Trade Organization (WTO) accession, but also look at the needs of China’s economic development and transformation.” Clearly, this point of view applies not just to the financial industry, but is also relevant to China’s overall economy. It has been over 16 years since China joined the WTO, and circumstances both within and outside the country have changed dramatically. China must take comprehensive steps to increase its openness. The yardstick for opening up should take into account openness in both the base and superstructure of its economy. There is some disagreement over how well China has fulfilled its WTO accession commitments. To be fair, China has, on the whole, conscientiously fulfilled its commitments and respected the WTO’s regulations. This is clear from how the country amended and tidied up a massive volume of laws, regulations, and official documents before joining the WTO, and significantly lowered tariffs after its accession. China has also surpassed most developing countries in terms of the openness of its service industries. When conflicts with trading partners arise, China defers to and carries out WTO decisions with considerable sincerity. However, with the intensification of economic globalization and the continuous growth of the Chinese economy, China’s level of openness is no longer compatible with its status as the world’s second-largest economy, and with its future development. The Chinese government is aware of this, and has made comprehensive plans for future reform and opening-up. China must beware of resting on its laurels, but many Chinese officials and academics still frequently flaunt China’s fulfillment of its WTO promises. This has become increasingly evident in their discussion of the recent trade conflict between China and the U.S., in which they appear to be clinging to an old idea that no longer matches the world around them. China’s 19th Party Congress called for the country to draw up and promote a new plan for opening up, and to develop “an open economy at a higher level.” China’s leaders have also vowed on multiple occasions to push for policies that open the country up to the rest of the world. After President Xi Jinping announced measures to increase China’s openness at the Boao Forum for Asia Annual Conference, the Chinese government decided to build a free-trade zone in Hainan province to gradually explore and advance China’s construction of special free-trade ports. Planned free-trade zones are also springing up rapidly elsewhere in China. In the future, China must do more than simply open up the manufacturing sector and lift restrictions on foreign shareholders and the scope of business foreigners can conduct. China will also need to accelerate the opening-up of the service industries, substantially loosen restrictions on access to markets, and promote the orderly opening up of service industries like finance, education, culture, and health care. In addition to actively inviting the rest of the world to participate in its economy, Chinese businesses must also improve the way they “walk out.” China should encourage and lead its businesses to improve the way they use both foreign and domestic markets and resources to make rational overseas investments and operate in compliance with regulations. Some foreign onlookers have criticized China for having “low standards” when it comes to opening up. This is mostly because there is a disconnect between China’s actual level of opening up and the level it has committed to. Since joining the WTO, tariffs, quotas, and other traditional trade barriers have been lowered significantly. However, other problems, including discriminatory supervision and a lack of transparency, still form an intangible barrier. This is especially apparent in the service industries. In order to further open up, China must become familiar with and make use of international regulations, and gradually align its domestic regulations with these. At the same time, China’s reforms must continue to be grounded in Chinese laws and regulations. China has been building its legal framework for dealing with the rest of the world ever since it began its reform and opening-up, and especially since it joined the WTO. However, this framework still needs improvement, especially in areas that still lack well-defined regulation or effective law enforcement, like intellectual property rights. China should pragmatically strengthen the construction of its legal institutions in accordance with the aims of the third and fourth plenary sessions of the 18th Party Congress. The country should further unify the laws and regulations relating to domestic and foreign investors while improving legislation related to foreigners and maintaining the stability, transparency, and predictability of its foreign investment policy in order to build a stable, fair, and transparent business environment that operates under the rule of law. Comprehensively implementing pre-establishment national treatment and the negative list management system have now become top-priority tasks for China. Many within China say the country should open up “as much as its abilities allow.” As an abstract principle, this is self-evident. But, in reality, this is usually an excuse for not opening up. Many of the promises China made in order to join the WTO as soon as it could were costly. But it still put in the difficult work to fulfill them. As a result, these fulfilled promises have become essential components for the healthy functioning of a strengthened Chinese economy. China gained valuable experience in rapid economic development by persisting in opening up and moving forward as much as possible, while working under the premise of controlling risk. Opening up further will require the right thinking and attitudes. In the post-financial crisis era, protectionism and populism are rearing their heads, temporarily obstructing the tide of globalization. However, a country cannot tend only to its own interests. Antagonistic behavior will ultimately be detrimental to all sides involved. We must all inevitably return to the path of dialogue, negotiation, cooperation, and mutual benefit. Reasonable compromises made in the process of negotiation must not be seen simply as surrender. To achieve this, China should try to cultivate a tendency toward a healthy national attitude, rather than a tendency toward loud confrontation. Otherwise, the existing plans to open up will be disrupted, and the Chinese government will be backed into a corner if a trade war erupts. China’s further opening-up should not be judged based on the commitments the country made when it joined the WTO. Rather, China should view the perseverance of its government, the vigor of its industry, and the rule-consciousness of its people during the time of its WTO accession as a valuable inheritance to be maintained for posterity. China’s path to high-quality development will be much smoother if it can stay on the path it took after joining the WTO.